The Sampling Shopper- You know St. Thomas shopping is tax and duty free, so you definitely want to see what kind of deals you might be able to score. 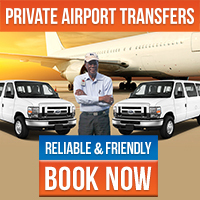 Maybe you’re not a super shopper and want to mix it up with some other St. Thomas activities, or perhaps your family is along and you want to share in the island entertainment. Our Shopping, Sightseeing, and Beach Tour is the perfect full day excursion for sampling St. Thomas’ shopping selection and incredible deals while including some island exploration. Start your day off with a visit to Downtown Charlotte Amalie where you’ll find amazing prices on jewelry, liquor, apparel, and more. After you rack up on savings and merch, you’ll take a ride around the island to behold breathtaking views and snap gorgeous photos. Head to Mountain Top for even more shopping at this mega store located at St. Thomas’ highest elevation point featuring tons of selection on souvenirs, apparel, and jewelry. Grab a cocktail at the massive bar and take a moment to appreciate the vista of Magens Bay and nearby islands. Spend the afternoon rewarding yourself for a day of deal-scoring with some relaxation in the tranquil Caribbean Sea at a top St. Thomas beach. Experience all the best of St. Thomas for you and your whole party with a day of shopping, sightseeing, and beach lounging! 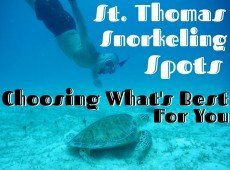 The Shopping Scout- You’re pretty serious about shopping, and you’re sure you want to rack up those St. Thomas discounts. But you want to take some time to see the island, and your family isn’t quite as thrilled about all the tax and duty free deals you’re ready to score. You won’t even feel like you’re compromising with a Shopping and Sightseeing Tour that provides ample time for your retail therapy as well as an afternoon of panoramic views, incredible photo ops, and a cocktail or two at the highest point in St. Thomas. If you’ve got your eyes on the prize and can’t compromise, a Private Sightseeing and Shopping Tour will allow you to shop until your heart’s content while your personal driver takes your family and friends on an island tour. With this private tour, you and your friends can also customize your itinerary to include lunch stops, island sights, and local shops of your choice for a perfect balance of shopping excitement and island exploration. The Shopaholic- You’ve heard of the legendary deals on jewelry, china, perfume, and more available in St. Thomas, and you brought an empty suitcase for all your loot. This 4.5 hour Private Shopping Tour is the ultimate shopping experience that you’ve been searching for. Imagine a personal driver who knows the ins and outs of the St. Thomas shopping market that’s yours for the day! Visit the well-known shopping areas such as: Downtown Charlotte Amalie where you’ll find specials on all types of gems, precious metals, diamonds, watches, and more; Havensight Mall, featuring a plethora of souvenir shops, sunglass specialties, and jewelry vendors; Yacht Haven Grande, home to luxury brands such as Louis Vuitton, Gucci, and Coach; or take advantage of your personal driver’s local insight on specialty deals. Get recommendations for a delicious local lunch, and shop til you drop with your friends without wasting your precious shopping time trying to find the best spots or worrying about taxi fares. Bring home the feeling of island escape and your favorite vacation memories with a special necklace, ring, or watch. 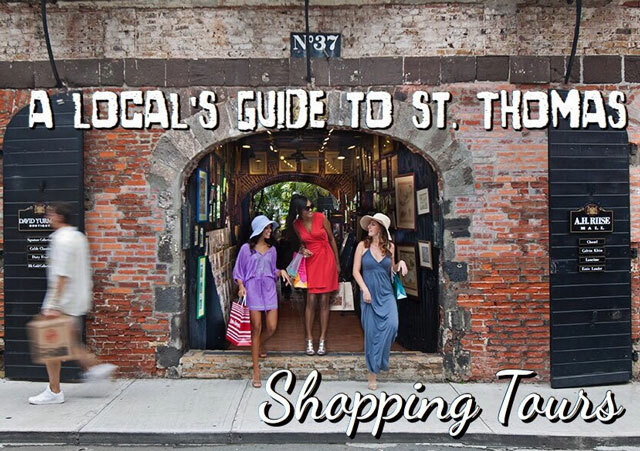 Use our Local Guide to St. Thomas Shopping to help you get your wish list started, and your shopping tour will make checking it off easy and unforgettable! Get ready for your day of deals! 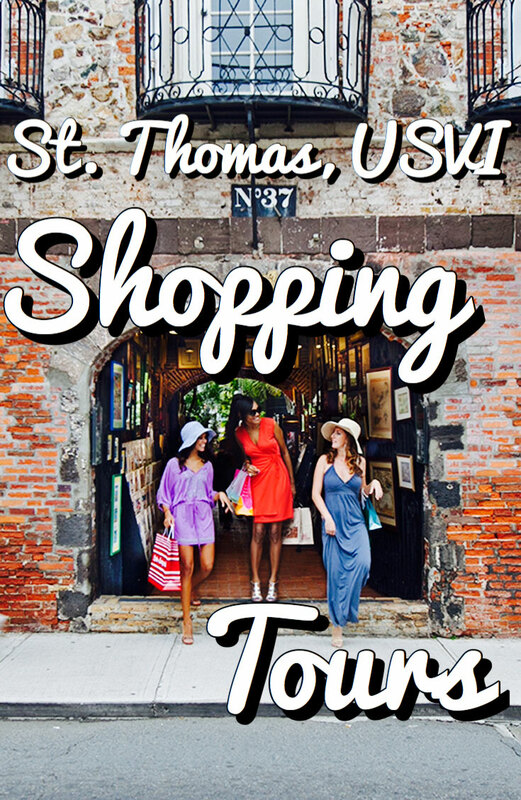 Be sure to check out our Shopping page to book the best shopping excursions in St. Thomas! If you have any questions about shopping tours in St. Thomas or any inquiries about the island, call or e-mail us for authentic local insight! 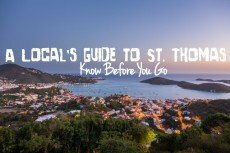 A guide to St. Thomas shopping tours and excursions. 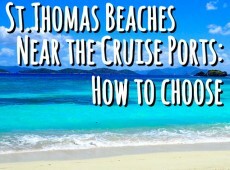 Discover the best ways to see the island and score tax free deals while shopping in St. Thomas.